The question I am most often asked is why I got a Kindle when I already have an iPad, an iPhone, a laptop and whatever other digital means to read books that I possess. While it is true that I could read on all these other devices, there are multiple reasons I prefer to read on the Kindle Touch rather than on any of the other devices. E-ink While the other devices all use backlit screens to display information, the Kindle Touch uses e-ink, which essentially is closer to reading paper on a screen. It is easier on the eyes to read than the iPad screen, especially when reading before bed. Form Factor The Kindle Touch’s 6″ screen is smaller and lighter than the iPad and conveniently fits in a pocket. Fitting in a jacket or jeans back pocket means I can carry the Kindle Touch with me everywhere when I know I will have some time to read. Less Distractions The Kindle Touch is a device created primarily for reading. Although it can play some games, play mp3s and surf the web, when reading a book, there are no bells, whistles, popups or any other notifications that distract from reading a book. There are no other apps running at the time that will take a reader outside of the actual reading, which cannot be simply done when any of the other devices are connected online. Sharing Across Devices In addition to having the Kindle, I have the Kindle app on my iPhone, iPad and laptop. 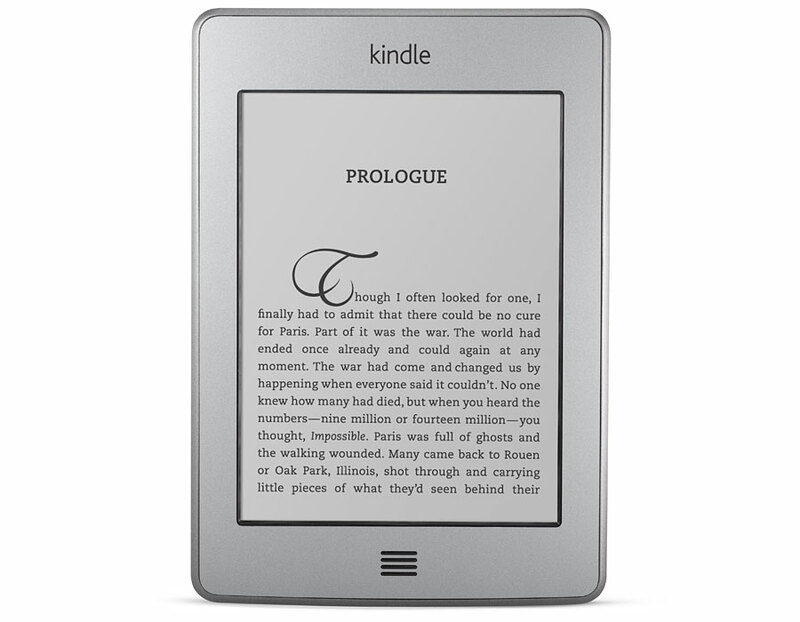 When I purchase a book via the Kindle or email a book or document to it, that book can then be found in the Archived section of the menu, so the same book can be read across devices and only needs to be purchased or emailed once. Whispersync In addition to being able to read the same book, if the device or app is internet connected, it will create a virtual bookmark to where the last place in the book was read, which can then be picked up by another device if it is online and go straight to that point in the book. Admittedly the Apple iBooks app does this as well, but it is a very handy feature. Customizable Font Sizes While I personally like the smaller print, when showing the Kindle to people of older generations, who have trouble with small print, they appreciate the ability to increase the font size to a size that is more readable to those who have trouble reading the smaller letters. With all the benefits of the Kindle, I have one complaint. When reading a book, it doesn’t display page numbers, just a location number and a percentage of how far into the book the reader is. The iBook app gives number of pages and how many pages left in the chapter, a feature I really liked, but has no comparable feature. The Kindle Touch I own also has the “special offers,” and I am often asked how the advertisements affect the reading experience. The ads are only shown as a screen saver when the Kindle is not in use or a banner at the bottom of the screen when on the menu screen to select a book to read. They do not appear when reading and have no effect on the actual reading experience. The Kindle Touch 3G is a great device for consuming books. Thanks to the features above and the integration with the Amazon store, giving access to every book I would want to read no matter where I am, my voracious appetite for reading can be sated by this small device.